Hanukkah is a Jewish holiday that is celebrated around the world for eight days and nights. Hanukkah celebrates the victory of the Maccabees or Israelites over the Greek-Syrian ruler. A Menorah is a special nine-branched candelabrum. Each night of Hanukkah, an additional candle is placed in the Menorah from right to left, and then lit from left to right. On the last night, all the candles are lit. 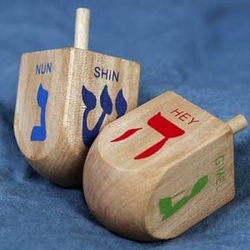 A dreidel is a four-sided top that has a Hebrew letter on each side and is used to play a game. During Hanukkah, families eat latkes(potato pancakes) and sufganiot (jelly donuts), or other foods which are fried in oil, to celebrate and commemorate the miracle of the Festival of Lights.